A packed house at Baltimore Metropolitan Council. 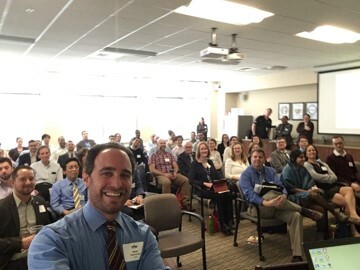 We had a great turnout (nearly 60 attendees!) at the Baltimore Metropolitan Council for our February 5th pedestrian safety technical meeting. Thanks to all who came out for the event. 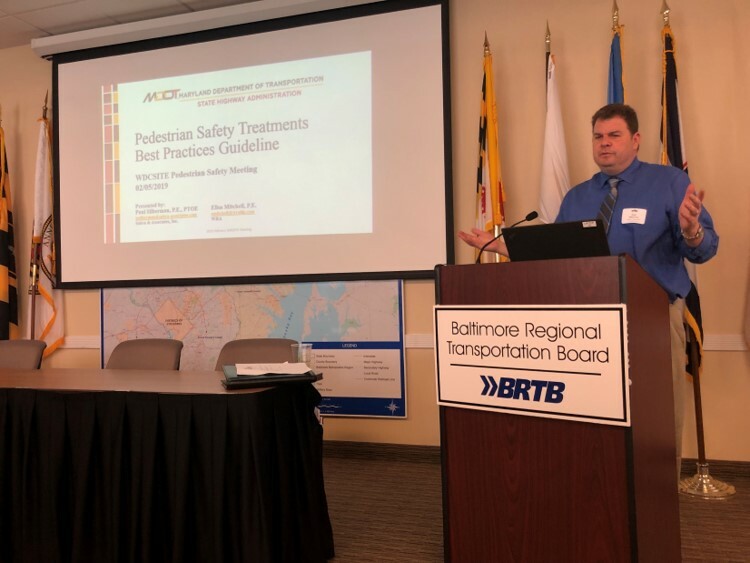 The event started with Paul Silberman (Sabra and Associates) presenting on work he did for MDOT SHA to prepare a pedestrian safety best practices guideline. Paul Silberman (Sabra and Associates) talks about best practices for work he did for MDOT SHA. 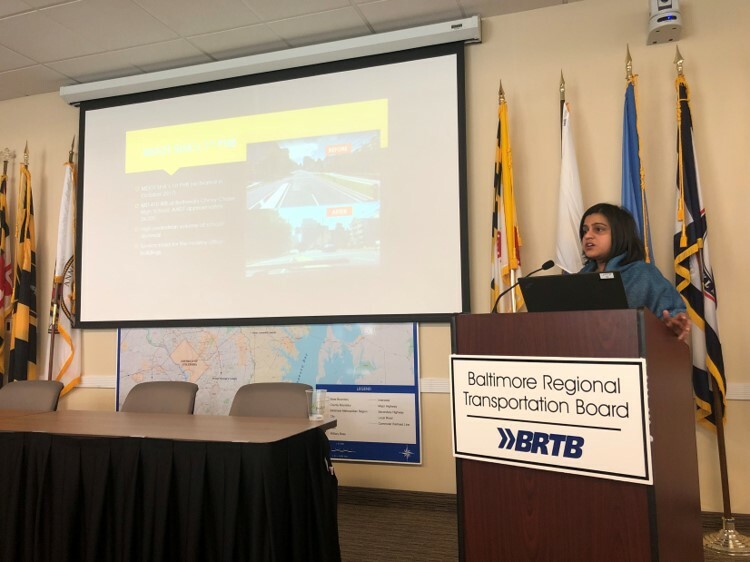 After, Anyesha Mookherjee (MDOT SHA) elaborated on that guideline and other pedestrian safety planning/engineering initiatives at the Maryland state level. Both Paul and Anyesha gave some great insights of pedestrian safety in Maryland. Eric Sideras (Montgomery County) joined Anyesha Mookherjee and Paul Silberman on the panel to answer questions from the audience. 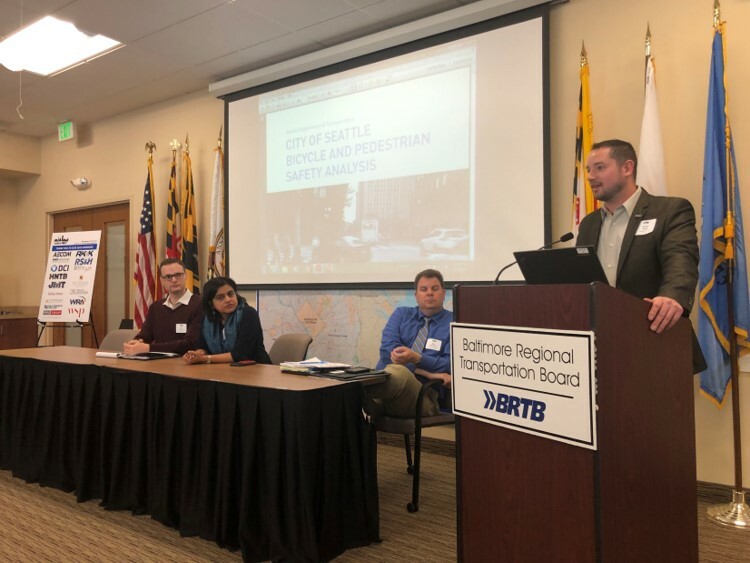 Dustin Kuzan (Prime AE) moderated while the experts gave their thoughts on pedestrian safety programs in Maryland and the planned training program on pedestrian and bicycle safety through the state’s Strategic Highway Safety Plan. This event served as a kickoff to that program, which will be coordinated with ITE, ASHE, and YPT. A panel of experts fields questions from the audience on pedestrian safety. After the meeting, several people made the short journey over to Amber for a happy hour to continue the discussion and engage in networking and fun.